Al Khasais-ul-Kubra is a one of the legendary writings of Imam Jalaluddin Al-Suyuti (1445–1505 CE) dealing with miracles and distinguished charecteristics of our beloved Prophet Muhammad (صلی اللہ علیہ وسلم). Imam Suyuti was a great scholar of Prophetic traditions (Hadith) and of the explanation of Quran (Tafsir). Suyuti is famous for his highly acclaimed commentary (Tafsir) of Quran called "Tafsir Jalalain". 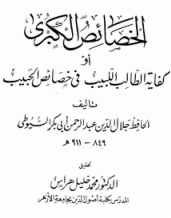 This book is called "Al-Khasais al-Kubra fi Mu'jizate Khair-ul-Wara" (i.e. The Great Specialities and Peculiarities in the Miracles of the Best of all Creations Prophet Muhammad [Peace be Upon Him]). and is an authoritative book on the subject. Laden with traditions of Prophet Muhammad [PBUH] from various books of Hadiths. This book brings to light some most less commonly known aspects of prophet's miraculous aspects, noble miracles and specialities that no one in the entire human history has ever achieved. The books starts with extraordinary events that took place both in Makkah and around the world before, at and after the birth of Prophet Muhammad PBUH followed by extraordinary events throughout the first 40 years in the life of Prophet Muhammad before God made him His last Prophet to the entire humanity till the end of time followed by extraordinary events throughout the prophetic part of his life till his death. This book is also a compendium of Prophetic traditions illuminating often hidden aspects of Prophet Muhammad's life. This book by an esteemed scholar of Islam's history, is one of the most authoritative on the subject of Prophetic miracles. It is to be noted that hadith scholars have pointed out some weak narrations in this book. Scholars should be consulted for correct explanation and understanding.